Designed specifically for children or young adults with moderate needs who still require pelvic stability but do not need the same advanced level of support as those with complex needs. Whether you're reading, learning, communicating or playing... it's all in a day's work with the Everyday Activity Seat. 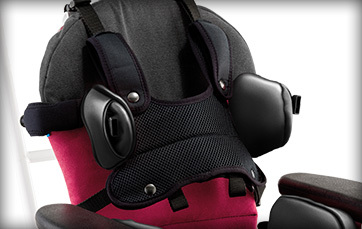 The Everyday Activity Seat offers exceptional pelvic positioning with a four-point pelvic harness which is easily adjusted from the center buckle. This is complemented by the seat's simple range of trunk, head, leg and foot positioning adjustments. In keeping with the needs of this user group, the Everyday Activity Seat provides optimal postural stability. 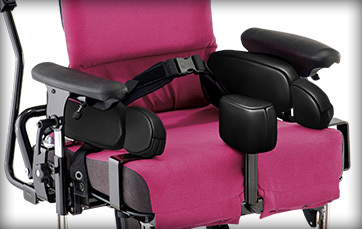 The Everyday Activity Seat is designed with every aspect of the user in mind. 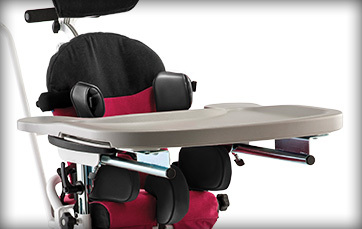 From the soft covers, to the molded armrests, the seat base cover which tucks underneath the seat base, the contoured back and the ramped seat cushion, the Everyday Activity Seat ensures the comfort (and therefore postural stability) of the client. With optimal postural stability and comfort achieved, the client will be able to use their arms and hands more effectively and independently. Along with the Everyday Activity Seat's height adjustability from floor to table (hi-low chassis), activities such as playing, eating, reading, writing or chatting with friends become easier and less tiring.